Coinciding with the Narendra Modi government’s one year in office on May 26, the new facility is expected to be inaugurated by the Prime Minister to showcase the airport as one of its achievements. While Punjab has been demanding that the airport be named “Shaheed Bhagat Singh International Airport”, Haryana wants it named after Chandigarh. The issue is pending with the Union Civil Aviation Ministry. 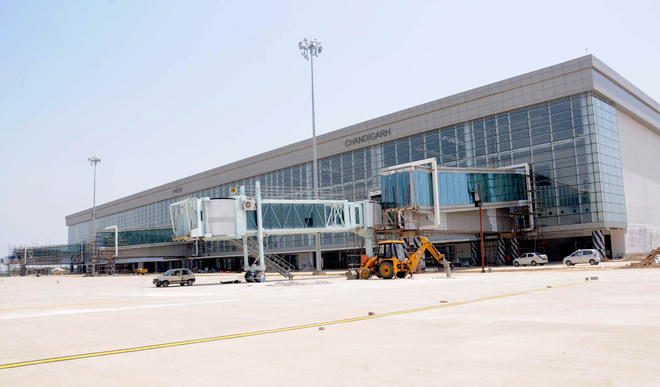 Come June, domestic and international flights will take off from the new terminal of the Chandigarh international airport that has been readied by the Airport Authority of India (AAI) at a cost of over Rs 475 core. The date of the inauguration of the new facility by the end of May will be finalised in consultation with the PMO’s office. Officials of the AAI are also in touch with officials of Punjab, Haryana and Chandigarh. The AAI chairman has already informed the Civil Aviation Minister. Following the clearance from the Ministry of Defence, the schedule of flights to Dubai by two airlines is being finalised by the Aviation Ministry. “We have almost completed all the works. Only finishing touches are being given. We will hand it over the facility well within the stipulated time,” said DK Kamra, General Manager, AAI. Once functional, the AAI plans to shift the operations of domestic flights from the existing domestic building to the new terminal that has been segregated in two terminal portions — domestic and international. The departure facility has been planned at first floor and the arrival at the ground floor, on the pattern of the Delhi international airport. Sunil Dutt, Chief Executive Officer, Chandigarh International Airport Ltd, said the airport will be a harbinger of regional development. A lot of NRIs from Punjab will have the advantage of not going all the way to Delhi to catch flights. Vishwajeet Khanna, Principal Secretary, Civil Aviation, Punjab, said the state was in touch with the Union Civil Ministry. “The airport terminal building should be completed by May-end,” he said. The operations of the international airport will be run by a joint venture (JV) company in which 51 per cent equity share is of the AAI and 24.5 per cent each of Punjab and Haryana. While the AAI has invested in the construction of the terminal building, taxiway and other related infrastructure, Punjab and Haryana have contributed by way of transferring 300 acres of land to the AAI. The first phase terminal covering 53,000 sq metre will have a capacity of 1,600 passengers at a time and a parking space for 500 vehicles. There are 48 check-in counters; six escalators and 14 lifts. Three aero-bridges have already been provided and there is an arrangement for adding two more. One from the existing domestic terminal would be shifted, said an official supervising the engineering works at the site. Over the years, a total of three terminals have to come up. On the lines of the airport in Delhi, the entry and exit of passengers will be at different levels. The apron area will have a capacity for ten aircrafts. Officials of the AAI said murals and paintings that reflect the cultures of Punjab, Haryana and Chandigarh have been put up in the passenger circulation area. An artist has been hired for the purpose.